The treatments are finished! This is the final entry in a 12-part series on selected conservation treatments of artwork and photographs, as well as the final entry of "Preserving a Family Collection." 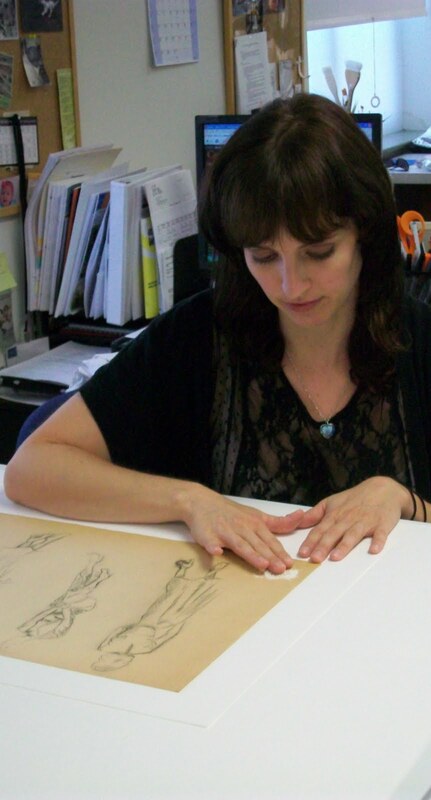 From the start, “Preserving a Family Collection” has been a supplemental blog to the main attraction, June and Art. The work of preservation is never an end in itself. Works are preserved in order to help us tell stories, to remember our past, and to continue to appreciate the work of our ancestors. The story of June and Art culminates today with a bride, a groom, and a wedding. And these blogs end here today on September 1, 2011, the 60th anniversary of the marriage of June and Art. My mother (June) loved brides and weddings. 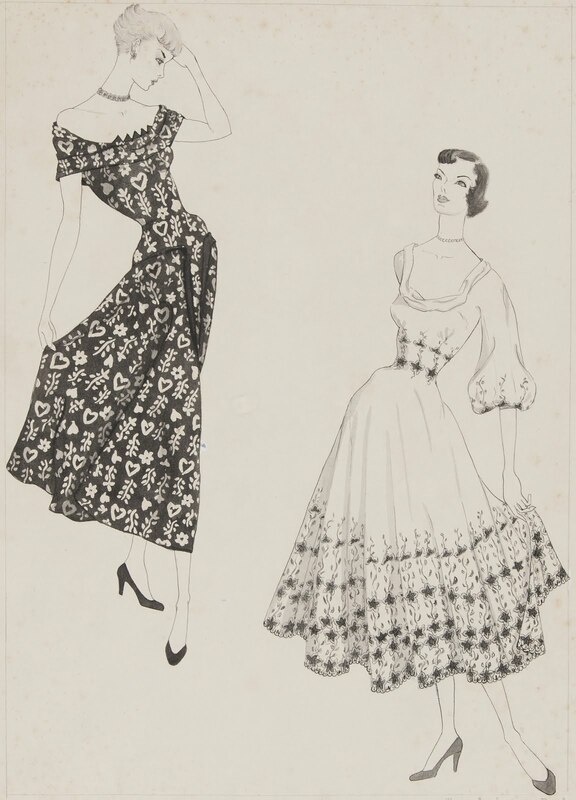 She drew several fashion illustrations of brides while studying at Traphagen School of Fashion from 1948 to 1950. Several years ago, I had the watercolor image of two brides cleaned, matted, and framed at the Conservation Center for Art and Historic Artifacts. This year, I returned to the Center to ask them to treat this smaller pen-and-ink piece. It had been glued to a backing support and the image itself was covered by a transparent plastic overlay. Thank you to Rachel Wetzel, Conservator at the Conservation Center for Art and Historic Artifacts, for her beautiful work conserving this lovely and meaningful item from our family collection! It provides a very fitting image to conclude this blog and to bid farewell to the story of the courtship of June and Art. And thank you to the followers and readers of this blog, “Preserving a Family Collection.” Take care of your stories. And best wishes for your efforts to preserve your family collections. Wedding dress drawing, before treatment. Wedding dress drawing, after treatment. The treatments are finished! This is the eleventh in a 12-part series on selected conservation treatments of artwork and photographs. "Preserving a Family Collection" concludes on September 1. Art on tissue paper by June Anderson. The art on this tissue paper is particularly fragile and precious. 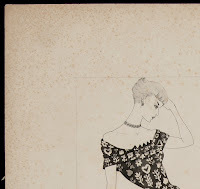 During their courtship, my father had bugged my mother to show him some of the fashion illustration work she was learning at Traphagen School of Fashion. 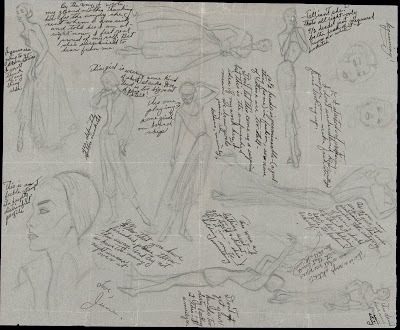 She finally responded by sketching a variety of typical fashion poses on a large sheet of tracing paper. All around the pictures, she jotted her notes with a felt pen. Then she folded the piece up tightly and mailed it off to Southampton with a letter. When I brought the piece into the Conservation Center for Art and Historic Artifacts (CCAHA) for treatment, it was in sad shape. Problems had probably started right from that first folding to fit it into an envelope. Thin tissue paper doesn’t fold well, and the tears may have started then. Sixty years later, there were many tears and deformations along the edges and folds. 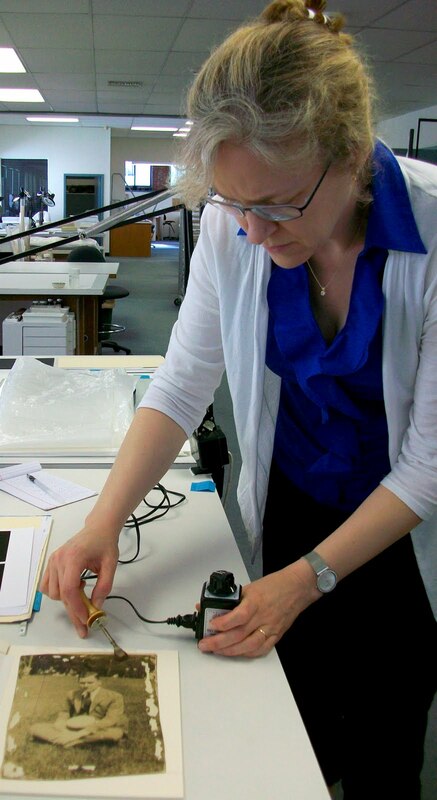 conservators adopted new techniques, including the use of an ultra-thin machine-made Japanese paper and an acrylic adhesive. The result worked well for both Sailor Jerry’s, and my mother’s, artwork. The mends are barely visible under normal lighting conditions. I’m delighted with the result – just as the people at Sailor Jerry Limited are pleased with their treatments. My mother’s treated artwork will go into storage. 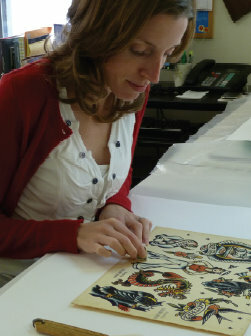 The Sailor Jerry work goes on tour, with exhibition stops scheduled at Mystic Seaport (Mystic, CT) and the Columbia River Maritime Museum (Astoria, OR). You might catch a closer look at the Sailor Jerry stencils at one of those sites, and – as for my mother’s artwork – you can take a closer look here in this June and Art entry. Art on tissue paper by June Anderson, before treatment. Art on tissue paper by June Anderson, after treatment. The treatments are finished! This is the tenth in a 12-part series on selected conservation treatments of artwork and photographs. "Preserving a Family Collection" concludes on September 1. 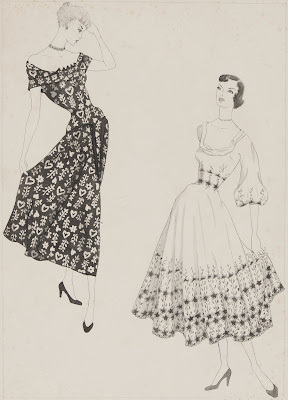 Two dresses fashion illustration by June Anderson. 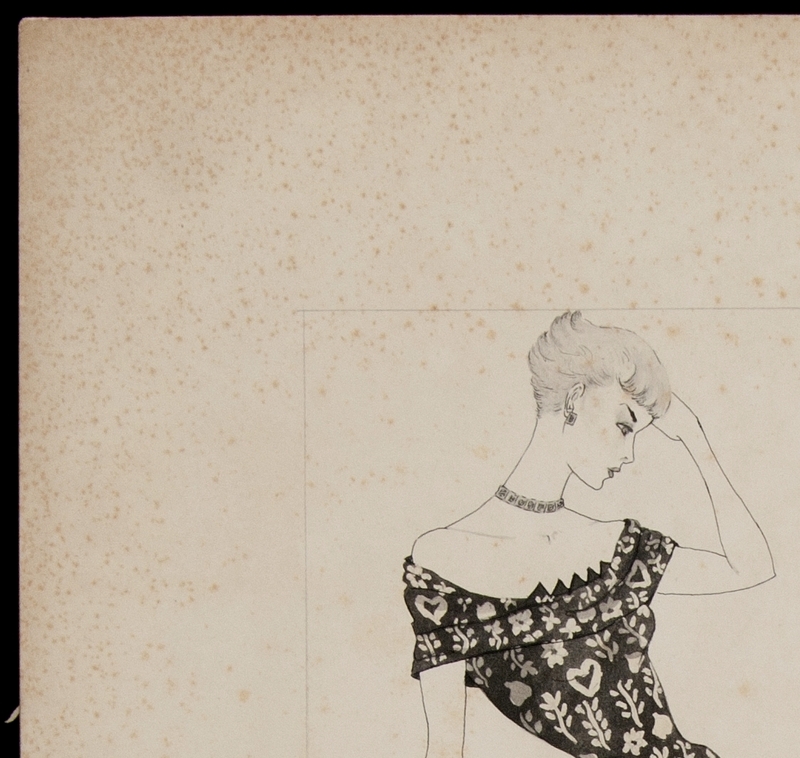 The brown spots around the perimeter of this fashion illustration are known as foxing. It increases in severity as you approach the outer edges of the piece, nearly becoming a uniform brownish tone along the edges. 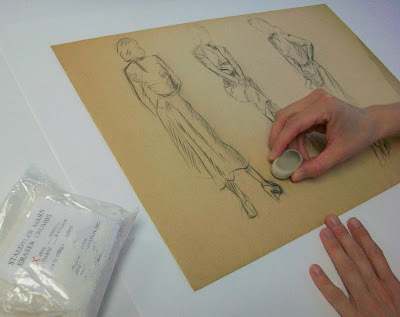 The fashion illustration itself is one of the nicest pieces that my mother drew while attending Traphagen School of Fashion from 1948 to 1950. It’s a shame to see it marred in this way. The good news is that there are no signs of any active mold growth. The foxing probably took place years – maybe even decades – ago and the piece appears to have remained relatively stable since. Sometimes conservators are asked to bleach the foxing out, but – while relatively effective – this strategy also tends to be time-consuming and, therefore, expensive. ﻿Historically important documents and artwork may demand this level of attention, but usually not items from a family collection like mine. In the case of this illustration, I’ve opted to live with the foxing. Fortunately, there is a less expensive – but still aesthetically pleasing – solution. Since the foxing is worse along the sides, matting the piece would hide much of the damage. It’s a simple and elegant solution. For this treatment, Jessica split the artwork from the backing board, removing the low-quality acidic filler between the board and the paper. Then the illustration was washed, humidified, and flattened. The foxing remains, but it will barely be noticeable after matting and framing. I hope that ultimately it will go up on a wall in my daughter’s room, alongside some other choice examples of my mother’s work in fashion illustration. The treatments are finished! This is the ninth in a 12-part series on selected conservation treatments of artwork and photographs. "Preserving a Family Collection" concludes on September 1. Surface cleaning a quick sketch by June Anderson. 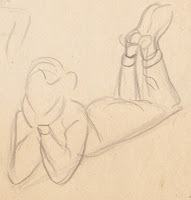 My mother drew dozens of these quick sketches while attending Traphagen School of Fashion from 1948 to 1950. Some of them are sloppy but more than a handful are pretty great – on a par with the best of her finished pieces. My favorite is the one of the woman lying down, chin propped up on fists. 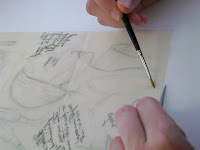 From the start, I’ve thought that some of these sketches deserve to be conserved, matted, framed, and displayed. cleaned them, working cautiously around the graphite artwork, before bathing them in a series of blotter washes, which significantly reduced the discoloration and acidity in the paper support. 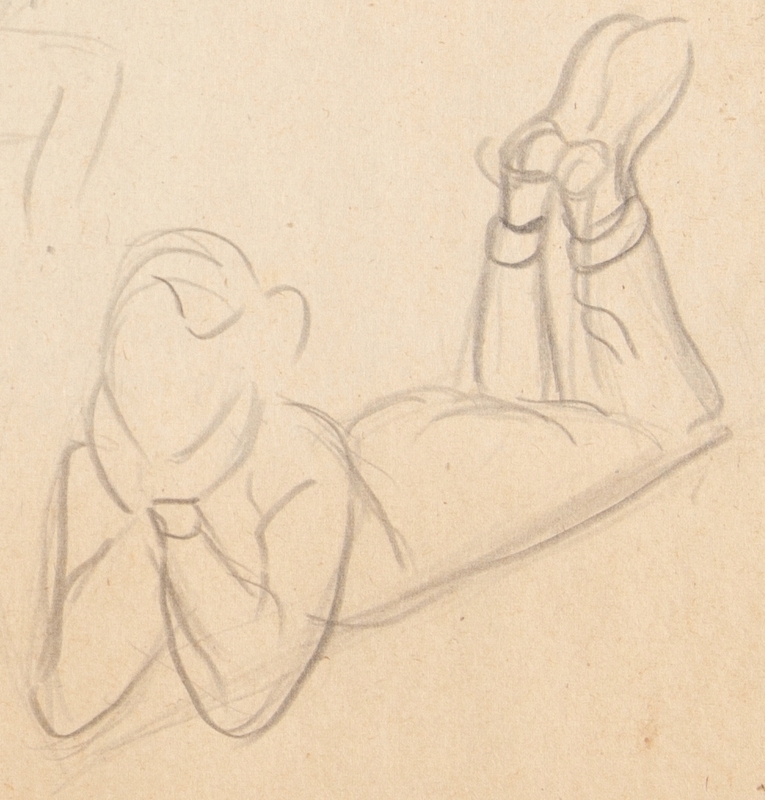 Ultimately, I’d like to bring more of these sketches in for conservation treatment. As with much preservation, I need to view this as a long-term process. These four sketches are ready to share with the world, the rest I’ll put into long-term (and non-acidic) storage, and then plan to return for additional professional conservation treatments as money becomes available or as an occasional holiday splurge (for instance, a happy-birthday-to-me present). Rachel endorses this long-term plan and strongly cautions against making any amateur attempts at home conservation treatment. “Don’t encourage do-it-yourselfers,” she said. “They can do a lot of damage.” And causing additional damage is the last thing that you want to do when working to preserve a family collection. First quick sketch, before treatment. First quick sketch, after treatment. Second quick sketch, before treatment. Second quick sketch, after treatment. Third quick sketch, before treatment. Third quick sketch, after treatment. Fourth quick sketch, before treatment. Fourth quick sketch, after treatment. The treatments are finished! This is the eighth in a 12-part series on selected conservation treatments of artwork and photographs. "Preserving a Family Collection" concludes on August 31. 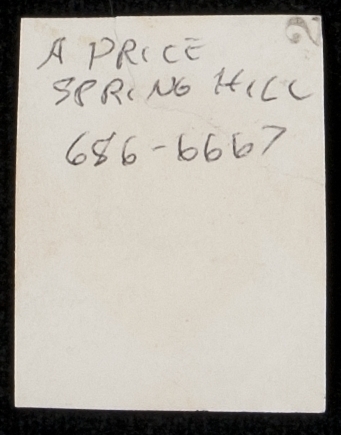 Of all the items we brought in for treatment, I think this tiny photograph may have been in the saddest state of all. 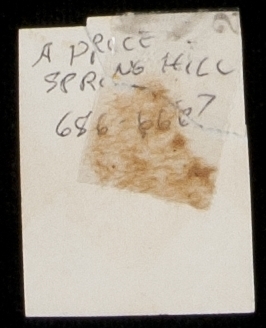 Only slightly larger than a postage stamp, the photo was thoroughly crumpled and a corner had been ripped off, only to be pasted back on by Scotch tape – the bane of conservators everywhere. that he never said anything nice about the monkey – a likely indication that they never became particularly close. When they sailed from Shanghai, the monkey stayed behind to become the charge of the next quartermaster. Treating this photo was a two-person job at the Conservation Center for Art and Historic Artifacts. 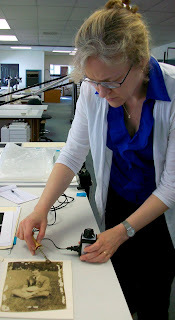 Rachel Wetzel, Photograph Conservator, used a heated spatula to remove the tape and then got rid of any remaining adhesive residue with a little organic solvent and a crepe square. It’s a real thrill to recover this picture and now we even have it in two versions. We have the original, now in better condition than we’ve ever seen it before. 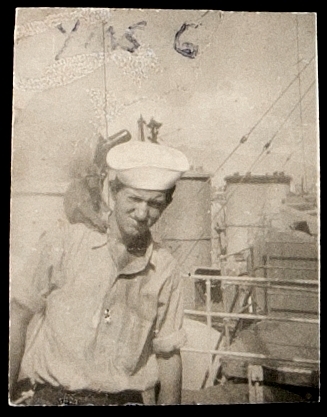 And we have a digitized image by Michelle Dauberman, Manager of Digital Documentation, that enables us to view this 65+ year old picture enlarged and close up on a computer screen – or even to post it on a blog. Our family’s legendary monkey is fully visible at last! 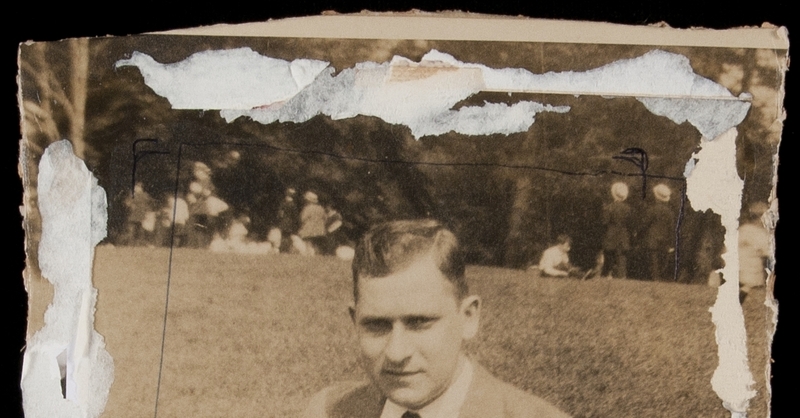 Art Price with monkey in Shanghai, circa 1945, before treatment. 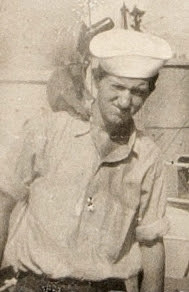 Art Price with monkey in Shanghai, circa 1945, after treatment. The treatments are finished! This is the seventh in a 12-part series on selected conservation treatments of artwork and photographs. "Preserving a Family Collection" concludes on August 31. Minesweepers at port in Shanghai, circa 1945. 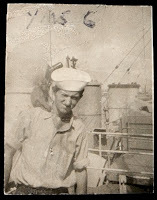 As quartermaster, my father served as the petty officer in charge of day-to-day navigation tasks on several minesweepers during his service in the Navy, 1944-1947. 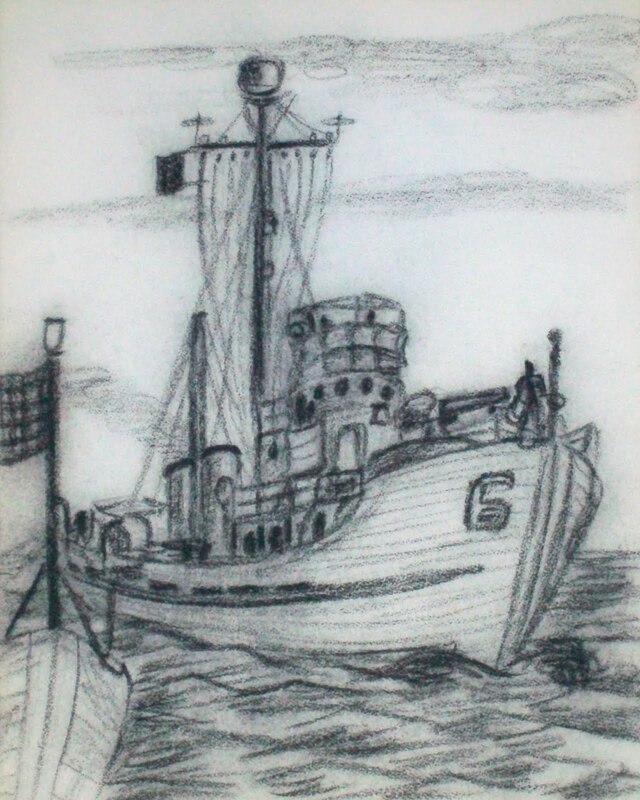 When he was stationed in Shanghai, his ship was the YMS6, a Yard minesweeper. 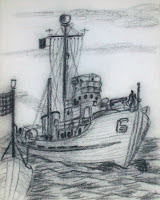 You can see it pictured in the photograph above (the ship with the 6 on its bow) and in his own drawing on the right. The treatment of this magnificent photo of American minesweepers at port in Shanghai, circa 1946, was assigned to Barbara Lemmen, Senior Photograph Conservator at the Conservation Center for Art and Historic Artifacts. There was a large tear running across the image surface along the far right side, as well as image losses along the top. 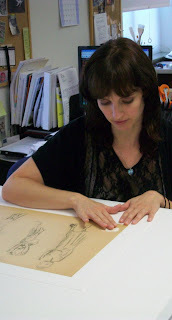 Barb mended the tear by working on the back, adding layers of Japanese paper adhered with wheat starch paste. This was followed by humidification and flattening. 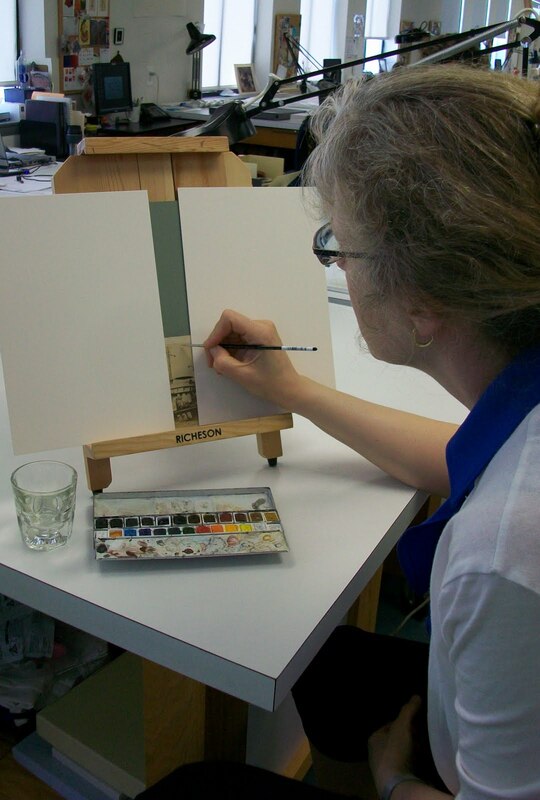 Barb Lemmen inpainting the photo. The final step is an aesthetic one. On a project like this, a skilled conservator is sometimes asked to inpaint the losses. I definitely wanted this. Inpainting reduces the distracting appearance of the damaged area. With a talented and experienced inpainter like Barb, inpainting can make the image appear much closer to its original appearance. Minesweepers in Shanghai photograph, before treatment. 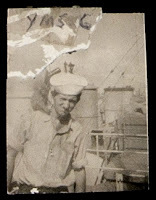 ﻿ Minesweepers in Shanghai photograph, after treatment. The treatments are finished! This is the sixth in a 12-part series on selected conservation treatments of artwork and photographs. "Preserving a Family Collection" concludes on August 31. On the “June and Art” blog, I identified this photo as Theodore Anderson at Brown University in the early 1920s. 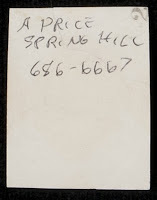 In retrospect, I could be wrong – he could just as easily be at home in Deep River, Connecticut or down south in Luray, Virginia, where he met and fell in love with Maud Clem. Theodore and Maud were my maternal grandparents. My grandfather mastered the dark room at an early age so it’s a very real possibility that this 8 x 10 enlargement may have been developed by him. The image itself has held up fairly nicely over the past 80 years. the mat. Finally, the mat was adhered directly to the image surface. and Historic Artifacts. Sometime in its history, the print had been removed from its frame and mat, leaving fragments of mat board and PVA residue along all four sides of the photo. Barb pointed out that removing PVA can be a challenge since it is not easily softened. She used a heated spatula to lift off many pieces of the mat board but had to leave some pieces where removal would have meant taking off some of the silver gelatin of the image. Barb commented that the image itself has changed over time – but not necessarily in a bad way. Originally, she said, it would have been a crisply detailed black-and-white image. However, partly because of the acidic board it was mounted on, the colors have deteriorated to these sepia and greenish-yellow tones. Details have been lost in the face and hands, and Barb ventured that the background has probably lost clarity, as well. But we both agreed that these changes have added a certain degree of charm, creating an effect as if we are looking at the photo across the mists of time. 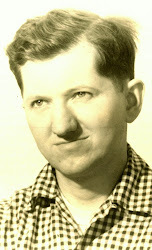 Photograph of Theodore Carl Anderson, before treatment. 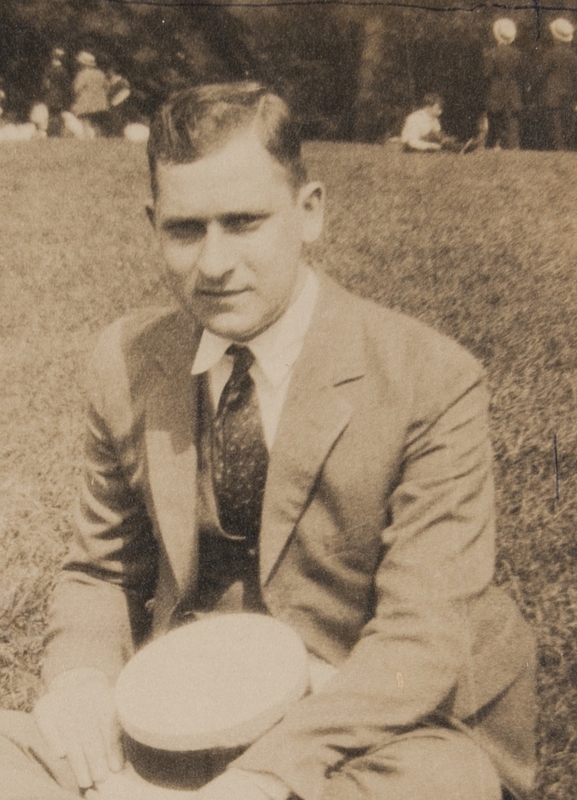 Photograph of Theodore Carl Anderson, after treatment. About "Preserving a Family Collection"
Preserving a Family Collection will document my efforts to preserve a family collection of photos, artwork, and memorabilia so future generations can continue to enjoy it. It is a companion blog to June and Art. 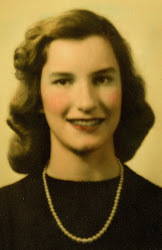 June and Art is a blog based on the love letters exchanged by my parents from 1949 to 1951. It draws heavily from the period photos and artwork in our family collection. 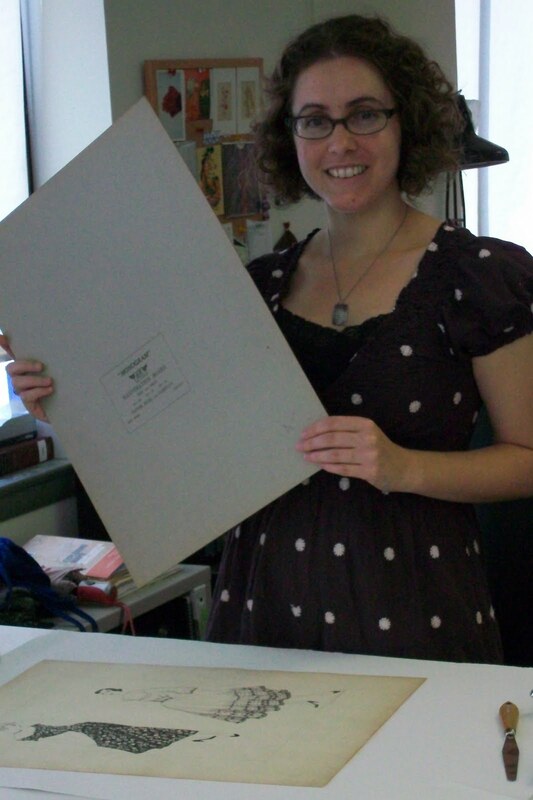 As with June and Art, Preserving a Family Collection will be a limited-duration blog with both scheduled to end on the same date, September 4, 2011. Lee Price is the Director of Development at the Conservation Center for Art and Historic Artifacts (Philadelphia, PA). He is the son of June and Arthur Price and co-creator (along with his sister Jamie Pelley) of the June and Art blog.